All along the wild and scenic Lochsa River. Awesome rapids the whole way and saw exactly one kyack in the water, though a bunch on cars. I rode mostly by myself today though met up with the others from time to time. I was stopped at one point and a van pulled up and the woman driving asked me if I needed anything. I didn't but she gave me a granola bar, a banana, and filled my water bottle. Her name is Kim and she is sagging three guys who passed us a couple of days ago on the Little Salmon. They are doing the TransAm. Kim said they feel guilty seeing us self-supported riders, so she compensates by helping us out as well. A true trail angel. 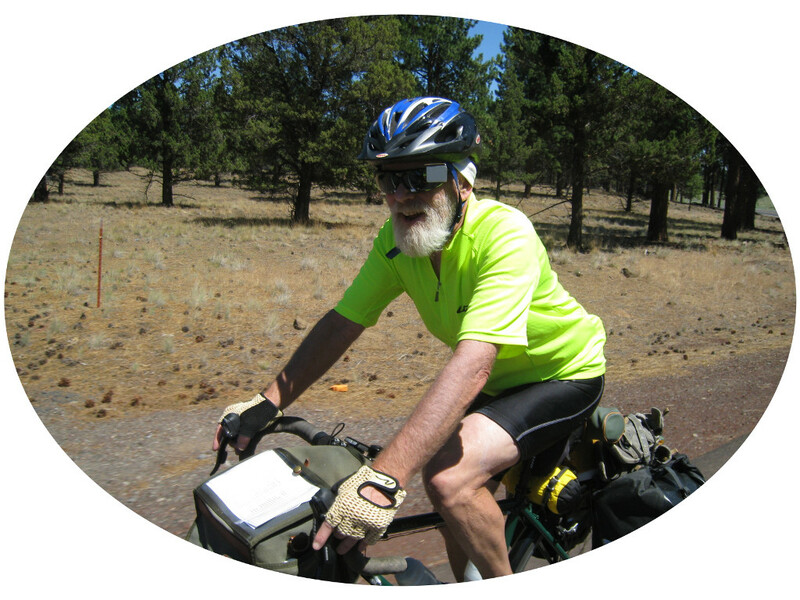 With just a few miles to our destination, John and I were riding together with Jim and Kathy not far behind, when it started to rain. John and got to Lochsa Lodge, but Jim and Kathy never showed up. I'm assuming they stopped at one of the campgrounds back a few miles and decided to stay. We'll probably see them tomorrow. We got our biked out of the rain and got a snack at the little store by the lodge. That's where we met Jodi who was also riding. She was riding a time trial bike and not packing anything. Her friend was coming with her stuff and they were camping at the Powell campground right next to the lodge. This was our destination as well. While we were still expecting Jim and Kathy to show up I went across to the lodge to use their wi-fi to send a message to Linda and post last nights blog. I then paid my $2.50 and took a nice hot shower. Soon Jodi's friend showed up and they headed down to the campground. We followed and took the spot next to them. Jodi's friend is Esther. Soon two other friends, Clint and Pay, showed up and proceeded to unload food and snacks on the picnic table at our site. I built a fire and the six of us talked for some time. Clint works for the forest service, and may works matching up Universities with projects that need to be done in the national forests. They appeared to all be in their 30's, well educated, and democrats. I believe Esther and Jodi live in Boise, Clint in Grangeville, and Pay in Missoula. I was really fascinated by these people. They made me feel like there may yet be hope for this country. 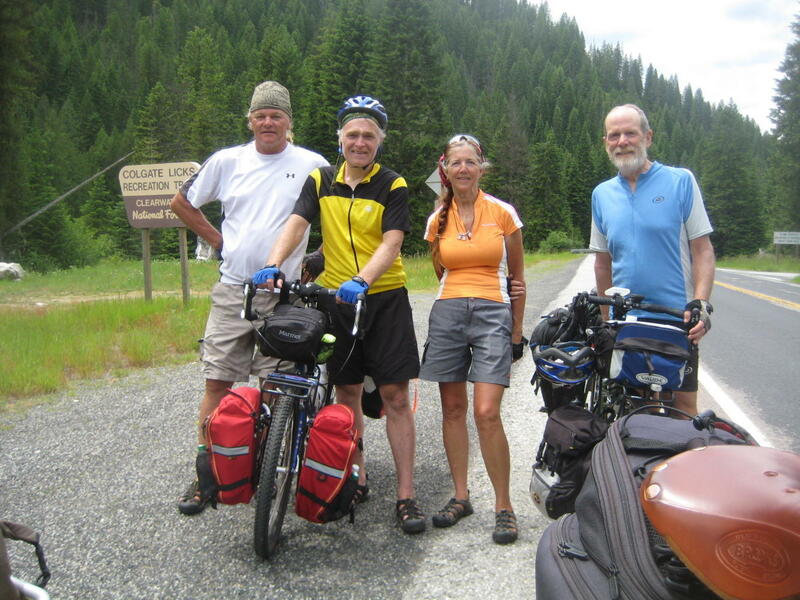 Tomorrow we climb the 15 miles to the summit of Lolo Pass, at which point we enter Montana. Then downhill to Lolo Hot Springs. I'll be in Missoula they day after tomorrow. A quiet section on the Lochsa River. Jim, John, Kathy, and Me. Jim took it with his camera that is smart enough to wait until one more face shows up before shooting. I saw two of these great foot bridges across the Lochsa. They connect to trails on the other side.